Starting with Ewan MacColl's Dirty Old Town , written about the great metropolis and capturing the effects of 200 years of industrial revolution and its aftermath, Manchester: A City United In Music moves through the 60s beat revolution, Strawberry Studios pop era, northern punk, indie mayhem and on to the Madchester years, culminating with an Oasis modern day-anthem. The tracks vary from the multi-million selling hits of Wayne Fontana, 10cc, Herman's Hermits and Simply Red to the cult musical art of Haydock's Rockhouse, Wynder K Frog and Smack. Well-known artists like the Hollies, Georgie Fame and John Mayall are heard on some of their lesser-known but top-notch tracks. Cult singles are featured by the Purple Gang, Toggery 5, Gerry & the Holograms and the Dakotas. Local personalities abound - Chris Sievey in pre-Frank Sidebottom guise with the Freshies, the Bard Of Salford - Mr John Cooper-Clarke and Graham Fellows aka John Shuttleworth when he was Jilted John. Future stars like Graham Gouldman and Dave Formula are present on great tracks recorded before fame arrived, while legendary producer Martin Hannett's name threads through the track-listing. 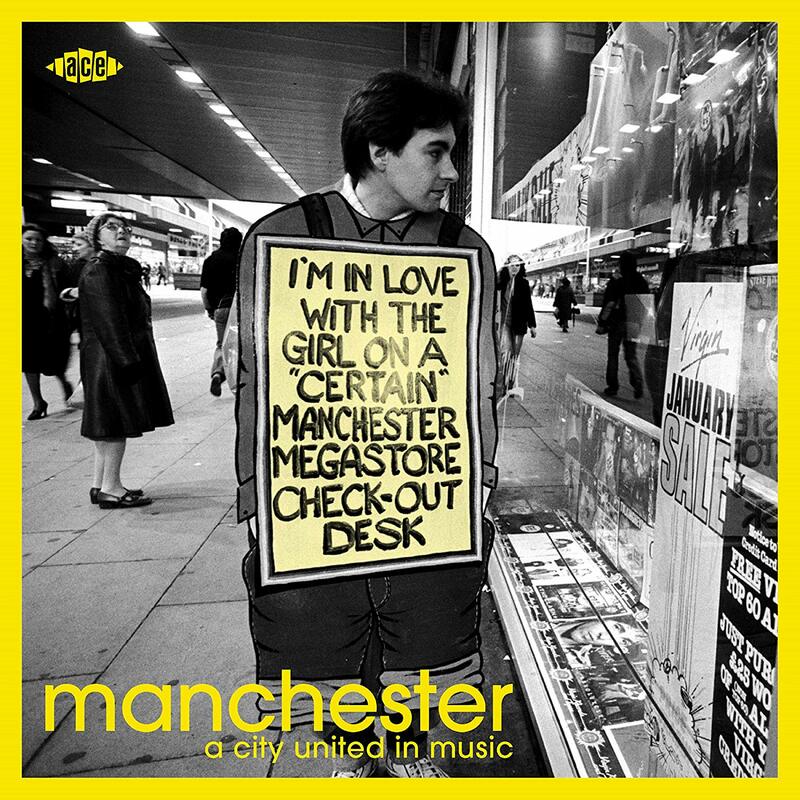 Manchester's soulful roots can be heard on tracks by Elkie Brooks, Sweet Sensation, M People and Blue Zone, while earlier attempts at R&B were made by beat groups the Measles, Pete MacLaine & the Clan and the Whirlwinds. A dozen years later a raucous in your face musical rebellion was taken up by Buzzcocks, Slaughter & the Dogs and the Salford Jets. That burst of pent-up energy was then followed by the moodier angst-ridden sounds of Joy Division, Magazine and the Fall, and their younger followers the Stone Roses, Happy Mondays and Inspiral Carpets. Sequenced mainly chronologically, this 2CD set and its accompanying booklet tell a fascinating story of a city's musical history and examine how it came to be. Photos many by noted Manchester scene photographer Kevin Cummins and artwork from the period, along with the reminiscences from the players, bring it to life again. The striking digipak features a photo of Chris Sievey lurking outside Market Street's Virgin Megastore, and the package is enhanced with a 44-page booklet and extensive notes by compiler CP Lee with an overview by Jon Savage.